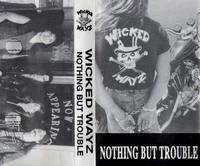 Wicked Wayz- Nothing But Trouble – 1991 Demo on cassette. This is the Wicked Wayz from Pueblo, CO who released one full-length album in 1994 entitled Attitude of Madness. This is the band’s debut demo recorded and released as a 14 song demo/album in 1991 and is a bit rough production-wise but a very professional looking package with B&W extensive fold-out glossy J-card with photos, lyrics and credits and 2-sided clear cassette with homemade band-stamped label w/ track titles and logo. All 14 songs are original, exclusive tracks not available on their Attitude of Madness album (with the exception of “Hammer Down.”) The 14 songs are a bit unpolished and amateurish but the band performs with total power and energy mixing classic European metal and NWOBHM with US Power Metal! 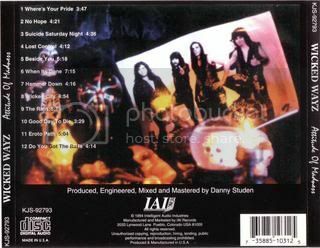 RARE 1991 DEMO FEATURING CLASSIC '80s EUROPEAN INFLUENCED HAIR-METAL IN THE VEIN OF MOTLEY CRUE MEETS IRON MAIDEN!! Ссылка есть - файла нет. Попросил обновить.